A bold dramatic shrub that grows to 6' tall and wide. The large, deeply divided leaves are grey-green with an iridescent blue hue. Spikes of dark burgundy flowers bloom in spring. This selection of honey bush was named for Seattle plantsman, Steve Antonow. 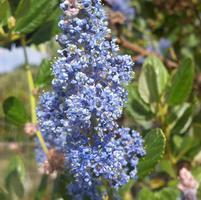 Honey Bush is a fast-growing, evergreen shrub. Unpruned, it'll form a rounded mass of foliage around 6' tall and wide but can be kept smaller if necessary with pruning. The smooth grey-green leaves have a wonderful pinkish-purple cast which becomes more intense as summer goes on. They leaves are around 18" long and deeply divided with toothed margins. They're carried on thick, gray-green stems and are good additions to cut flower arrangements. In late spring, showy one foot long flower spikes appear. The flowers have deep brick-red bracts with green stamens, later followed by ornamental papery seed pods.